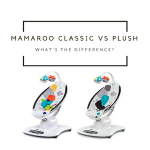 Nuna Leaf vs Mamaroo vs Rock ‘N Play: Find the Best Baby Rocker in 2017! I never knew how important baby rockers are. 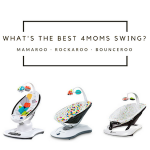 But in that period where the baby isn’t quite crawling, but still moving around enough so that he can hurt himself, a comfy baby rocker that he can be securely strapped in is a lifesaver. There are three big players in the infant seat world and I’ve tried them all. They all have qualities that would make them a great addition to any nursery or play area. The trick is to find the one with the qualities that are right for your family. Can evolve with your baby. Plush and entertaining toy bar. Rock safe base and motion lock. The toy bar is sold separately. The belts lock together with Velcro which tiny pieces can fall off of and isn’t as secure as buckles. Have to push it to keep it in motion. Five unique motions designed to move like parents do. MP3 compatible if you want to use your own sounds. Bluetooth enabled for remote control via your compatible smart device. Toy mobile with reversible, removable toys. Movements can be a bit shaky. The seat is on the shallow side, and some babies will not feel secure enough to calm down. The buttons do not light up and can be a bit frustrating in the dark. 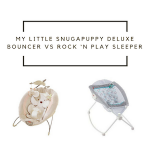 Sleeper & playtime seat in one. Comfy incline helps baby sleep. Hands-free rocking motion at the push of a button. AC plug for battery-free operation. Easy to clean design with the washable pad. Easily folds up and is ready to take wherever you need. Seems to have some motor issues where a lot of customers complain about the motor burning out around a month after purchase. The motor belt tends to break. Needs to be plugged in to use the auto-rock feature. Our winner had to be the Nuna Leaf. It had some issues and not as many bells and whistles as the others, but its sleek design and simplicity stole the show. If you want a seat that will grow your child without all the hoopla that comes with most infant seats, then this is a good investment. 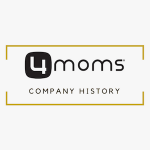 4Moms’s flagship seat had to be on the list. At around the same price as the Leaf, it gave the winner some heavy competition. In the end, there were a few more technical problems with the seat that kept it from topping Nuna’s offering. Fisher-Price is a beloved brand in childhood toys and accessories, and we would have loved for rock n play to come in higher, but it just had too many mechanical flaws to beat out the competition. While it is the best bargain of the trio, we just felt the flaws outweighed the value.